Lasuna has a variety of potent sulphur-containing compounds which are the reason for its characteristic pungent odour. Allicin, the vital compound in the pod, is known to have great anti-bacterial, anti-viral, anti-fungal and anti-oxidant properties. That is why garlic is best had when it’s finely chopped, minced or pureed and let sit for some time. Garlic is also a reliable source of selenium. Allicin, along with other compounds like ajoene, alliin, etc. Also have a healing effect on your circulatory, digestive and immunological systems and help in lowering blood pressure, detoxification, healing, etc. 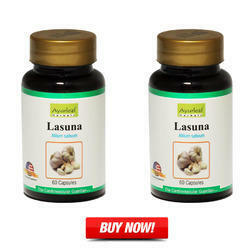 Lasuna / Garlic Capsules help in improving your iron metabolism. In addition to being a good source of selenium, garlic / lasuna may be a more reliable source as well. Scientists call Garlic / Lasuna a "seleniferous" plant as it can uptake selenium from the soil even when soil concentrations do not favor this uptake. The cardio protective benefits of Garlic / Lasuna may partly rest on the production of hydrogen sulfide (H2S) gas. Our red blood cells can take sulfur-containing molecules in Garlic and use them to produce H2S. This H2S in turn can help our blood vessels expand and keep our blood pressure in check. Garlic has been recognized as having anti-inflammatory properties. Possess Antibacterial and Antiviral properties. Aids in controlling blood pressure. Lower our blood triglycerides and total cholesterol and reduce arterial plaque formation. Helpful to increases insulin release and regulates blood sugar levels in diabetics. Ayurleaf Herbals Garlic / Lasuna comes in attractive packaging of 60 Capsules and it is recommended to take 2 Ayuleaf Herbals Garlic / Lasuna Capsule (500mg each) Morning & Evening. The most preferable range from Ayurleaf Herbals Garlic Capsules as it ensures a healthy heart and gives plentiful benefits. These are manufactured with the latest techniques but have installed with the pure and chemical free ingredients. The garlic capsules, herbal garlic capsules, we possess are extremely safe and don’t have any side-effects. These are more advantageous and beneficial to recovery of heart attack patients. 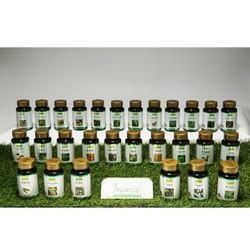 In addition, we are one of the ruler manufacturers among the herbal garlic capsules manufacturers located in India. Ayurleaf Herbals Garlic Capsules contributes the most effective way to take Garlic with 100% absorption because of its availability in capsule form. Further, it also supports the natural defense mechanisms of the body. Ayurleaf Herbals Garlic / Lasuna capsules have cholesterol protection properties. It prevents deposition of Cholesterol in coronary arteries, has anti inflammatory, anti bacterial, anti- hypertensive, analgestic and anti flatulent actions. It also improves digestion, have anti- arthritic action and relieves join pains. Garlic / Lasuna traditionally being used to maintain cholesterol level, improves digestion and relieve joint pain. Health Magic Aloe Juice is stabilized Aloe Vera (Barbadensis) juice, which is rich in essential nutrients, vitamins, enzymes and minerals. It increases the elimination of toxins. Improves assimilation. Improves nutrition. It corrects digestive system. Increases cell re-generation. Retards ageing process. Increase energy level. Boosts up Immune system. It is useful for people having Digestive disorders, Acidity, Arthritis, Asthma, Osteoporosis, Diabetes, Liver disease, Kidney disease, Ulcer, Piles, High Cholesterol, Cardiac problems, Constipation, Diarrhea, Eczema, Psoriasis, Alcoholism, Any type of Cancer and HIV (Aids). Available in 1000 ml and 500 ml jar. Also available in Jeera and Orange & Honey Flavor. 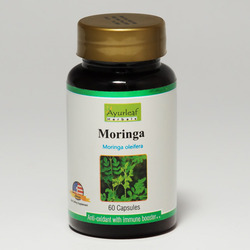 Organic Moringa Leaf Powder is used in a wide range of products from the dietary supplements to the smooth mixes. The leaves are carefully washed and dried at low temperature and then powdered. The leaves are not dried using heat at any stage of the processing and thus retaining the nutrient values of the leaves. The leaf powder is rich in vitamins, phyto nutrients, antioxidants, amino acids and is easily soluble in water. We as Ayurleaf herbals (Subsidary of KPD healthcare) has spreading its wings worldwide for registrations all herbal (Ayurvedic) supplements under dietary supplements categories with advance write up dossier for successful registrations all single and mutiple herbs capsules. Organic Moringa Leaf Powder Organic Moringa leaf powder is used in a wide range of products from the dietary supplements to the smooth mixes. The leaves are carefully washed and dried at low temperature and then powdered. The leaves are not dried using heat at any stage of the processing and thus retaining the nutrient values of the leaves. 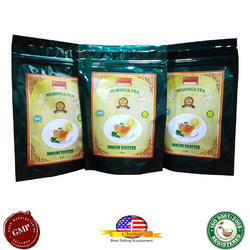 The leaf powder is rich in vitamins, phyto nutrients, antioxidants, amino acids and is easily soluble in water. Herbal/traditional self-treating remedies are increasingly popular in Romania, due to consumers' increasing awareness about the possible harming effects of long-term self-medication using standard OTC drugs. Value sales of herbal/traditional products experienced double-digit growth in every year of the review period. In 2013, value growth reached 14%, after a 20% rise in 2012. The performance of herbal/traditional products, not surprisingly, has surpassed the performance of overall consumer health. Competitive Landscape Hofigal SA moved up into the third strongest position in herbal/traditional products in 2013 (6% value share), thanks to its strong presence in herbal/traditional dietary supplements and herbal/traditional cough, cold and allergy (hay fever) remedies. Societatea Nationala Plafar SA (5% value share in 2013) also has a strong presence in value sales of herbal/traditional products and is an important player in herbal/traditional medicinal teas and herbal/traditional tonics and bottled nutritive drinks as well.